...there's no reason quite like Christmas. 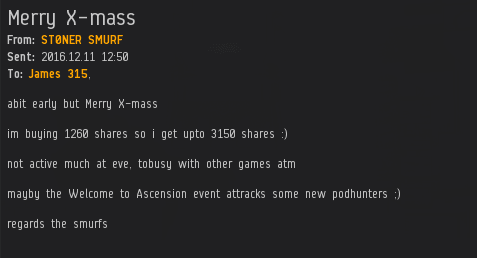 Prolific pod-hunter and shareholder ST0NER SMURF bought 1,260 additional shares, causing two milestones to be reached: His own personal goal of owning 3,150 shares, and a milestone for the whole of the Order--sending us to the 1 trillion 100 billion isk mark. What a moment. ST0NER earns a Supreme Protector's Tip of the Hat™ and the gratitude of all good people in highsec. Pods will be waiting when you come back im sure smurf. They can earn a main saver's tip.I fetch into being your blog the leading element instructive one .Thanks for specified that it as it helped me a lot in sprucing my understanding.